10 Pahari Dishes From Himachal Pradesh You Must Definitely Try Once !! Himachal is the place to be when it comes to delicious food. The aroma of its wonderful delicacies is enough to hold a tourist here for days. If you’ll ask a first timer what is the best feature of Himachal, the person, would definitely say it is its mountains and greenery! But if you ask a Himachal lover, the vagabond who unconsciously always finds himself wandering on this magical land will say, it is its satiating food! So, whether you are a newly married couple on Himachal honeymoon tour packages or a travel junkie on a solo trip, do not forget to taste the flavour of Himachal this vacation because Himachali dishes are not just preparations of aromatic spices and tasty ingredients but its dishes reveal the beauty of Himachal, its dishes contains the flavour of Himachal, its serenity, its freshness, its inviting charm and the taste of its choicest of plentiful vegetation! Here are 10 phenomenal dishes of Himachal that are a must grab when here!! It is one of those dishes that represent the culinary culture of Himachal Pradesh. Prepared from chickpeas and vegetables, this delicious preparation has flavours of all major Indian spices from cardamom, cloves, and cumin to coriander powder, turmeric powder and cinnamon. Dhaam is a complete meal consisting of dal, rice, rajma, boor kikadi, and curd. To enhance the taste of the already so tantalising meal, the chefs present it with jiggery (gur). This dish is most popularly served during festivals. The unique feature of Dhaam is that only special chefs called ‘botis’ prepare this dish! Tudkiya Bhath is a kind of Indian pulav that Pahari people of Himachal prepare. What’s unique in this pulav is that it contains a whole lot of vegetables and lentils along with a range of fresh spices like cardamom, cinnamon, and garlic. The Pahari people relish it with yogurt! Popularly known as ‘kamalkakdi’, this vegetable preparation is prepared from thinly sliced lotus stem which is cooked with onions in ginger-garlic paste and with gram flour. This different and difficult to prepare delicacy is the heartbeat of Himachal’s food culture. It is mostly served as a side dish to some spicy vegetables and mutton. You can easily find it in local Himachali restaurants. Babru is the Himachali version of famous Kachori in North India. Containing the stuffing of black gram, this crispy delicacy tastes very different that kachori and is a must have when in this mountainous state of India. Originated in Spiti Valley of Himachal Pradesh, today this tempting dish is relished all over the state. It is prepared from buckwheat leaves and wheat flour in the form of pancakes or cakes and is a popular festival delicacy. Kullu is famous for trout fish in India. Rarely found in any other state, this fish is, therefore, a speciality of Himachal and is prepared with minimal spices to retain the original taste of trout fish. It is mostly relished with boiled vegetables. 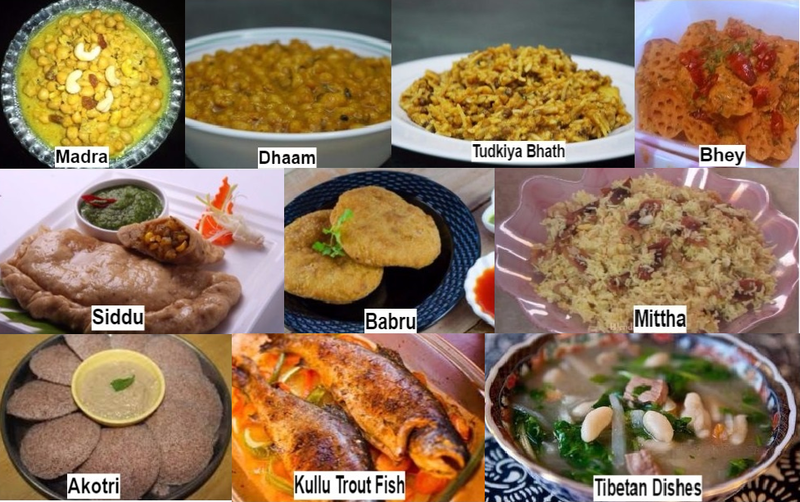 While there are a number of Tibetan dishes, few which are a must have in Himachal, for it is a part of Tibetan colony, are Thukpa, Luchipoti, Naizha, Thentuk, and Tingmo, and not to forget the famous ‘Momos’. This delicacy is one of the most popular dishes in Himachal. It is flavoured, sweetened rice which is blended with dry fruits and served as a sweet dish on special occasions. To Sum Up, Himachal is the place to be when it comes to delicious food. The aroma of its wonderful delicacies is enough to hold a tourist here for days. But then, its perfection in scenic beauty, gorgeousness in weather and number of tourist places, historical sites and temples, together just makes it a paradise for a lovely vacation.